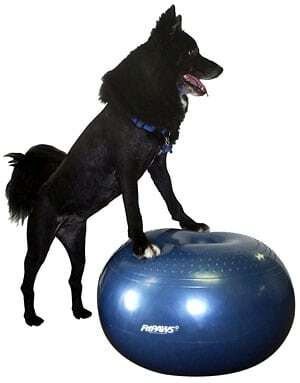 The FitPAWS Donut is another fun and helpful exercise tool from Ball Dynamics’ line of canine conditioning equipment. It is ideal for moderate rehab training with small dogs and puppies. For beginning rehab exercises, please consider the Balance Pad or Balance Disc. And for more difficult exercises, try the FitPAWS Peanut. The difficulty level of exercises using the Donut falls right in between these other FitPAWS products. The FitPAWS Donut may be used as a balance training tool or for core strengthening for small dogs that may be overwhelmed by the Peanut. It can also be used for weight bearing therapy to help strengthen rear legs. 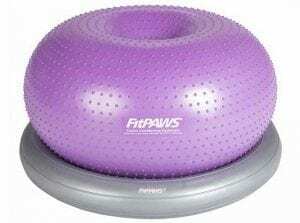 The FitPAWS Donut provides a moderate balance challenge. Its broad base offers more stability than a round ball. You can also adjust the balance challenge by under-inflating so the ball is not as firm – less air makes exercises more difficult. 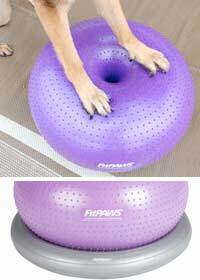 The FitPAWS Donut is made with a professional grade heavy-duty PVC material that resists tearing caused by dog nails. It has textured bumps on one side and a smooth surface on the other side. It is approximately 12” high and easily inflates/adjusts with the included hand-held air pump. Inflation Tip: The FitPAWS Donut is inflated by measuring to a desired height, not by air pressure (psi.) For best results, do not inflate over 13” high, measured when the Donut is sitting with the flat side on the ground. An inflated height of 12” is optimal for most dogs. The FitPAWS Donut can be inflated with the included air pump or your own air compressor that has a cone-shaped attachment. On the side of the Donut, you will see a white plug that will need to be removed before the air will go in. The plug may be taped to the side of the Donut. If it is, remove and keep plug handy. Place the tip of the pump’s cone shaped attachment in the hole of the Donut, inflate to desired height and replace the plug firmly to hold the air inside. To remove air from the FitPAWS Donut, simply remove the white plug from the side of the Donut and let out desired amount of air before replacing plug firmly. The more inflated the Donut is, the less it will move when your dog is on top and the less challenging it will be. The less inflated the Donut is, the more dynamically it will move and the more challenging it will be. Please review the important information in this demonstration video and consider the following tips to make exercising your dog with the FitPAWS Donut fun, safe and beneficial! Introduce dogs to the Donut slowly, in a fun way, using positive reinforcement. Place your dog’s front paws on the Donut and slowly bounce for weight bearing exercises to strengthen rear legs. Entice your dog to stretch forward and up, increasing weight on rear legs, without allowing him to climb up. Have your dog reach toward his left side for a treat, and repeat to left for core strengthening. Assist your dog onto the Donut, do not allow him to jump. Slowly shift Donut from side to side and see your dog strengthen his core muscles to hold on. Shift Donut forward and back to help strengthen your dog’s forelimbs and paws. Slowly bounce Donut while allowing dogs to sit on top. Place Donut with studded size up for easier traction. Use a harness with a handle to help your dog onto the Donut and/or remain remain stable during exercises. Use treats such as green beans, carrots or a favorite toy to avoid over-feeding during training. *Do not allow larger dogs to arch their back to use the Donut, consider using the Peanut instead. Please consult your veterinary rehab specialist to develop an exercise routine best suited for your dog, and watch for the following signs of distress or fatigue. Adjust the duration of your training as necessary.